A dramatic fight-back in the quarter-finals of the Doha WSF Men’s World Junior Team Squash Championship at the Khalifa International Tennis & Squash Complex in the Qatar capital Doha sees India back in the top four of the biennial World Squash Federation event. The seedings suggested a close encounter against Asian rivals Hong Kong China, the fifth seeds – but fourth seeds India were on a mission to make up for a fifth place finish in the 2010 championship. 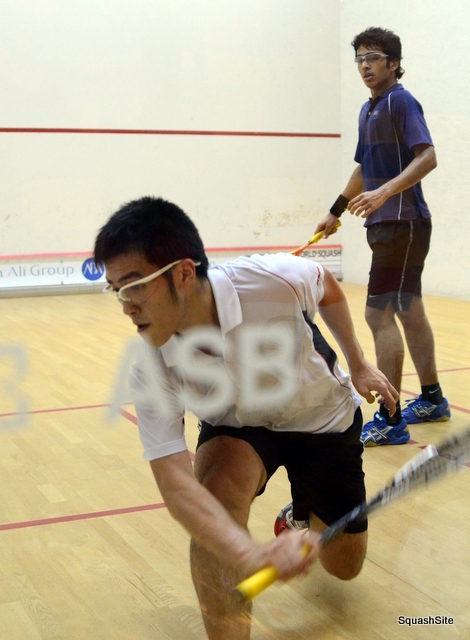 Hong Kong number two Yip Tsz Fung put the underdogs ahead with a straight games win over Vrishab Kotian. But top string Mahesh Mangaonkar levelled the tie for India after just 28 minutes, beating Cheuk Yan Tang 11-4, 11-4, 11-2. But a courageous performance from Indian number four Kush Kumar saw the 16-year-old from Dhampur battle for just over an hour to beat Hong Kong’s 17-year-old third string Yeung Ho Wai 11-9, 11-7, 3-11, 12-10 to clinch his country’s berth in the semi-finals. 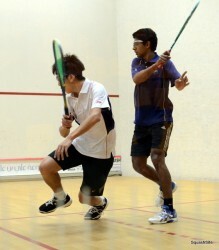 “We were certainly taken to the wire,” Indian coach Cyrus Poncha told the event website www.wsfworldjuniors.com later. “We knew Hong Kong were a very strong team, and we were ready for it. 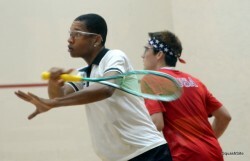 “In our first match, Vrishab was not able to match his opponent’s consistency. In the second one, Mahesh showed his class, with his great volleying and aggressive drives. “Kush has played something like 10 matches in a month including winning the Asian Junior U17 title, so he’s got great experience and confidence that comes with it. He sometimes doesn’t play enough volleys and drop shots, but he surely did a lot of them today,” added Poncha. Hong Kong coach Wai Hang Wong responded: “I told my players that India was a strong team, and to really try and do they best, and I think they did. Our number two put us in a good position, but we knew that their number one was too strong, and that it would come down to a tie. India’s reward is a meeting with favourites Egypt. The defending champions, looking for their fourth title since 1994, despatched Canada 3/0 – the new two-time world junior champion Marwan El Shorbagy making sure of victory with an 11-3, 11-6, 11-9 win over the Canadian number two Tyler Olson. “Egypt are so strong,” admitted Canadian coach Jonathan Hill. “We knew going into the match that we would find it difficult against the top seeds. Marwan can sometimes hit a few errors and Tyler upped his game in the third but couldn’t quite sneak a game. The other semi-final will see second seeds and four-time former champions Pakistan take on England, the No3 seeds and also previous winners of the title four times. Pakistan, who have been playing without their injured top string Danish Atlas Khan, brushed aside surprise opponents Japan 2/0 in well under an hour. Khan has now returned home – and has been replaced in the lower order of the squad by 16-year-old Syed Ali Shah Bokhari. 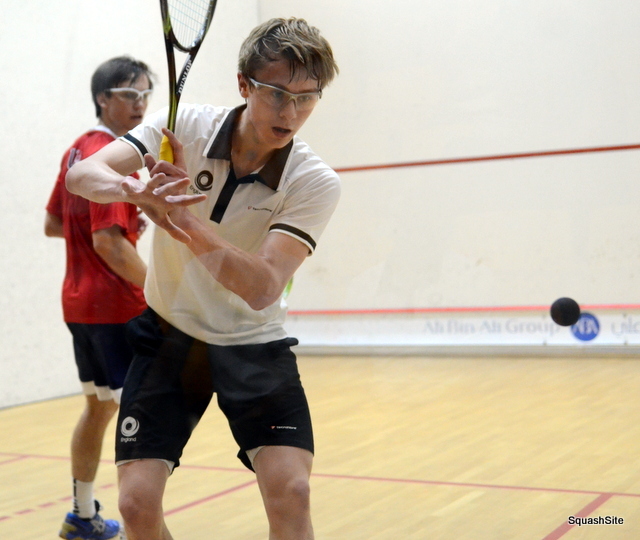 Despite resting squad number one Ollie Holland, England defeated sixth seeds USA – Richie Fallows and Thomas Fordboth winning 3/0 to put the third seeds through to their 17th consecutive semi-final.